The other night I went out to my screened-in porch and my cats were staring at the floor. The decking boards are separated a half inch, and I could see something furry moving beneath them. I grabbed a flashlight and shone it through the gaps. It looked like an opossum, judging by the hairless rat-like tail. That’s nothing new in my neighborhood (along with raccoons, foxes, feral cats, rats, rat snakes and armadillos). With a stick, I poked the little guy in the back, but he wouldn’t budge. Scanning the porch for more advanced weaponry, my gaze landed on a can of insect repellant. A quick shot on his back, and the creature made a beeline out from under the porch onto my front yard. I suspect it was the hiss of the can’s nozzle that actually flushed him out. Instead of appreciating the DEET protection from my neighborhood’s voracious mosquitoes, he looked a little agitated (although it’s hard to read a opossum). Anyway, problem solved. Well, maybe not. A couple of days later I came home to a pile of dirt inside my enclosed porch at the same corner. Pretty good trick to get dirt on top of the floor boards, I thought. 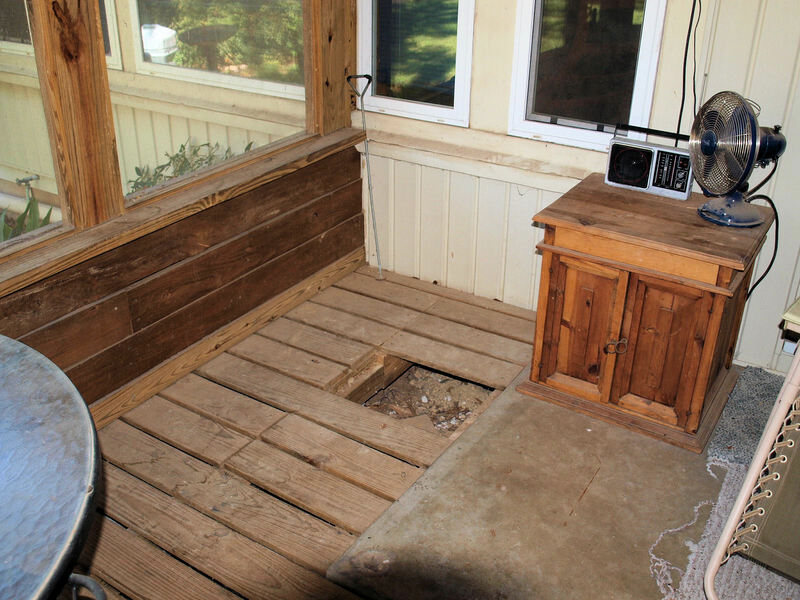 It took me a little longer than I’d like to admit, but I finally realized that an animal had been digging so furiously beneath the floor boards that he flipped up dirt through the gaps and it settled on top. I’m not a opossum expert (although I played one on TV) but this was a lot of dirt for one of them. I suspected the scourge of Texas lawns: an armadillo. Again, I retrieved the flashlight and tried to peer under the floor. All I could make out was the mouth of a dark hole. Something stank. The smell was similar to what you get when you pour the contents of a ripe cat box into a garbage can, add a deer carcass, and then set the mix out in the sun for a week. (Don’t ask me how I know that.) I needed access under my porch for a closer inspection. 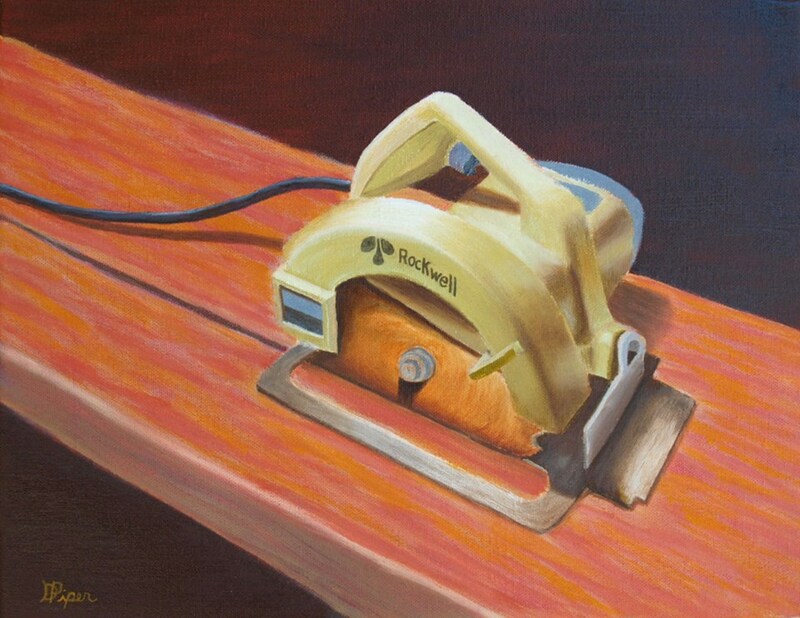 In the 70’s, I bought a Rockwell circular saw. I’ve become so attached to it that I immortalized it in an oil painting. It ripped through my floor boards and exposed the hole in the ground. Even with unfettered access I couldn’t see the end of it using a flashlight. If I merely filled the hole with dirt would I trap the critter, whatever it was, under my porch? I imagined the foul smell elevating to a sufficient level that my neighbors might burn down my house for relief. I needed to make sure that hole was unoccupied before I filled it in and then sealed off the perimeter of my porch. From my garage full o’ crap, I produced a boom-box and tuned it to a country music station before facing it into the stink pit. If anything was in there that had ears, it would be driven out before morning. After a fitful night of sleeping to the caterwauling boom-box, I got up and tested the hole by inserting a springy toilet bowl snake around the dark bend. There was no push-back on the snake and no sound. A couple of 5-gallon buckets of gravelly dirt poured into the hole filled it. I screwed down replacement deck boards and then sealed the perimeter of the porch with concrete blocks. Problem solved—or so I thought. A couple of days later I went into the backyard to cut bamboo and trim roses, and I twisted my ankle in a freshly-dug hole against the side of the house. 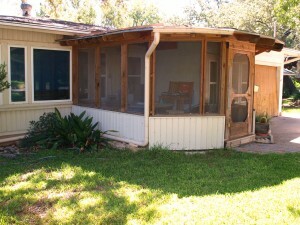 That damned armadillo had just moved to another piece of real estate! My neighbors are pretty much fed up with all-night music, so I’m thinking about stinky mothballs down the hole as the next battle tactic. This entry was posted in Uncategorized by uncledave. Bookmark the permalink.